Give your young player the tool they need to play their best with the new Puma evoTOUCH 1 Jr firm ground cleats featuring a super soft calf skin leather upper. Give your young player the tool they need to play their best with the new Puma evoTOUCH 1 Jr firm ground cleats. The first Puma cleats to focus squarly on improved touch, the evoTOUCH 1 uses super soft calf leather in the upper for superior ball feel and comfortable fit. The evoFIT knitted sock creates a snug but barefoot-like feel while the GripTex technology on the inside prevents slipping inside the shoe. The soleplate of the evoTOUCH 1 for kids includes a SpeedTrack spine for enhanced reactivity and torsional stability plus conical studs for stability and acceleration on firm, natural grass surfaces. 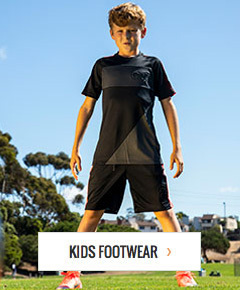 Shop soccerloco now to get your child Puma soccer cleats with fast shipping and easy returns.